Product #18318 | SKU NP-L7S | 0.0 (no ratings yet) Thanks for your rating! 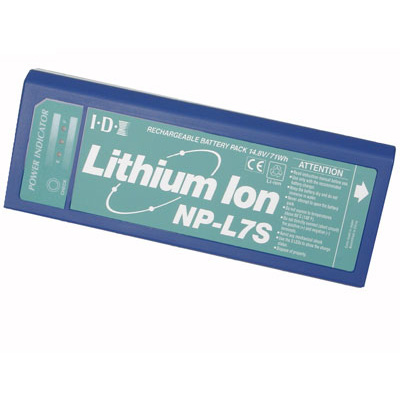 The IDX NP-L7S is a 14.6 VDC/4.6 Ah NP-style Li-Ion (Lithium-Ion) battery. With convenient features, practical size, low cost and high-performance characteristics, the NP-L7S is designed to fit just about any application. The NP-L7S features a built-in LED for an instant visual display of battery power status. Unlike conventional cells that are damaged by fast charging, IDX individually selects and balances each cell for optimum life and performance. Professional camcorders operate on a 12-volt system. As per their design, a majority of camcorders will activate a low voltage warning or even cease to operate when they determine that the battery has fallen below 11-volts. Most equipment manufacturers suggest that a higher voltage battery should be used whenever possible. Your investment is protected externally by a tough ABS case and internally by a high temperature battery protection circuit (Auto Reset Temperature breaker type). The NP-L7S incorporates a three LED array, for quick and precise indication of the remaining battery capacity.